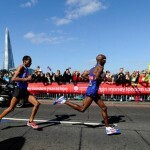 It wasn’t the fairy-tale debut that many hoped for, but nonetheless there was an English marathon record for Mo Farah (coach: Alberto Salazar) as he finished eight in the 2014 Virgin Money London Marathon. 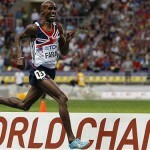 Opting to run in the second group in the early stages, Farah passed halfway in 63.08 some 38 seconds behind the leaders, but he was starting to make inroads into the early deficit. 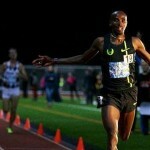 However coming up towards 20 miles, running in virtual isolation, Farah started to slow. In the end the double Olympic champion had to settle for a 2.08.21 clocking, 12 seconds inside Charlie Spedding’s English record but a minute down on Steve Jones’ 29 year old British record. 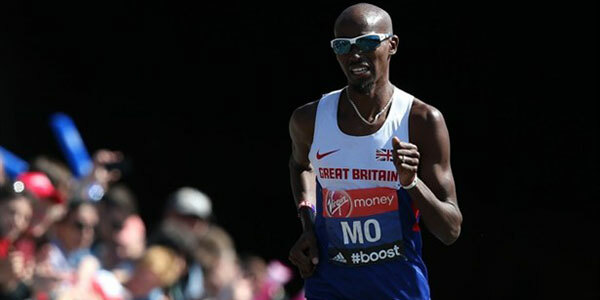 Victory went the way of London 2012 Olympic bronze medallist Wilson Kipsang of Kenya, who broke the course record with a 2.04.29 performance. Also making his debut was Chris Thompson (Alan Storey/Mark Rowland) who took silver behind Farah over 10,000m at the 2010 European Championships. Targeting a time in the region of 2 hours 10 minutes, Thompson set off with training partner and fellow Brit Scott Overall (Storey) in a small group being paced for 2.10. 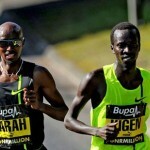 They ran side by side most of the way before Overall began to struggle with the pace in latter stages and dropped off. Thompson hung on though, and despite a painful last 800m clocked a pleasing 2.11.19, good for eleventh place. In the end Overall finished just inside 2.20, but there were breakthroughs for Steve Way and John Gilbert who both went inside the British Athletics standard of 2.17.00 for the European Championships. The women’s race was a lot closer in the final stages, with namesakes Edna and Florence Kiplagat sprinting down the mall side by side. In the end it was two time world marathon champion Edna who proved stronger, edging away to win by three seconds in 2.20.21. The first Briton home was Notts AC’s Amy Whitehead (George Gandy) who finished 13th in a time of 2.34.20, just over 30 seconds outside her personal best. This performance is inside the British Athletics team standard of 2.35.00 for the European Championships in Zurich this summer, with the GB & NI team due to be announced on Tuesday (15 April). One place further back was 44 year old Emma Stepto (Alan Rowling) who stopped the clock at 2.36.05, putting her top of the Power of 10 V40 marathon rankings. In the elite wheelchair races, Switzerland’s Marcel Hug prevented David Weir (Jenny Archer) rewriting the history books with what would have been a record breaking seventh London Marathon title. The pair broke away in the closing stages, but as they turned into the mall Hug had a one second advantage, which he held all the way to the finish to take victory in 1.32.41. The women’s race was a very different story though with 2013 winner Tatyana McFadden taking a commanding victory, a winning margin in excess of one and a half minutes. First Brit home was Shelly Woods (Archer) in sixth place in a time of 1.54.52, with 18 year old Jade Jones (Ian Thompson) ninth on her marathon debut, just dipping inside the two hour mark by a solitary second. Finally, in the IPC World Cup event, Richard Whitehead (Liz Yelling/Keith Antoine) was the only entrant in the T42 classification for double amputees, so was naturally the winner. He soaked up the atmosphere, finding time to give the crowd a taste of his trademark two gun salute as he crossed the line in 3.42.04. He will now turn his attention back to the track ahead of the IPC Athletics European Championships in Swansea later this summer.